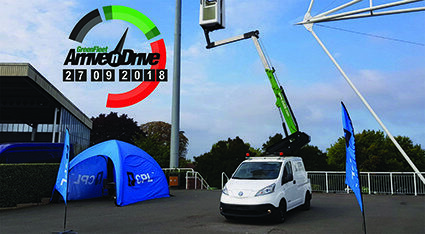 CPL to exhibit zero emissions cherry picker at Greenfleet Arrive’n’Drive. This week the team will be at Rockingham Speedway demonstrating the K20 Nissan eNV200. This superb conversion boasts a 10m working height and 5m outreach on a very compact vehicle with no outriggers. There is a 120Kg safe working load in the basket allowing for 1 person and tools. The no outriggers design allows for a quick setup for any project. The compact van makes it easy to maneuver through the tight city streets while still allowing plenty of room for tools and equipment. It can be put to work in the hustle and bustle of urban streets without affecting the flow of busy traffic. This unit comes with a green package as standard but all of the van mounted cherry pickers have the option of a green package. This allows the boom to be operated with the vehicle engine switched off. For further information on the Nissan eNV200 K20 please contact us.